George Foreman G5 Grill is now sporting a new design, compare to his previous grills have been very dull and dam right ugly. It is ergonomic and just makes you want to get one. It comes with five removable grills which can be used for a variety ways including baking, waffle making and of course grilling. Most importantly he helps in the fight for fat-free cooking. It can be used for all meals and is dishwasher friendly. We definitely recommend the G5 Grill, a must have for all kitchens. 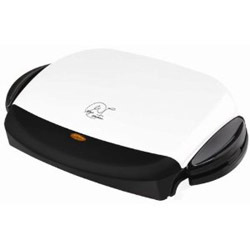 With your help we can reach more people and let them know about George Foreman G5 Grilling Machine whether this product works or not. I have been waiting for the G5 to go on sale at our Kohl's for some time because I was looking for a new waffle iron and the G5 has the plates for waffles. Kohl's finally had it on sale for $90 and I got a 30% off coupon in the mail that I used, so I got a great deal on it. The big plates make it easy to cook 4 large burgers or 2 nice sized steaks, but the best use for it is salmon. The waffle iron works great but does not have the crispy outsides that I'm used to on waffles. Needs extra oil on it to do the crispy. My favorite part is the clean up, just take off the metal plates and put them in soapy water and they come clean with very little scrubbing. The plates will wash in a dish washer, but I find that the drying cycle on our washer leaves a light white film on most non-stick items like pans and cookie sheets and these plates are no exception. So, I really like the G5, it has many uses, it's easy to clean, and cooks fast.